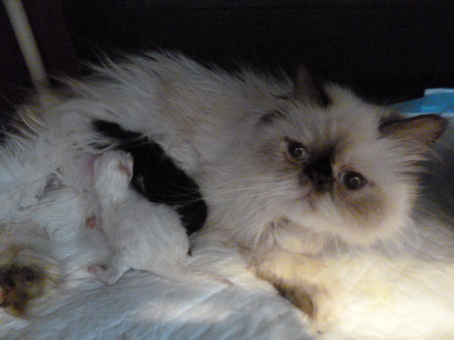 We just uploaded to our Youtube channel, Holly and Toy's 20 day old kitten's first video. Seems there is never enough time in the day any more for photo shoots and videos. Hopefully that will change as we start to catch our breath after 4 litters so close together. Holly and Toy's babies are doing great and growing so fast now. They started walking this past week. The rare Chocolate Bi-Color is a doll. Just watch him come walking to me over and over again. Holly, herself, has settled down and is not so fiercely protective, though she does try to block me with her body when I try to pet them. LOL. Next week I might start weaning them on to wet food but Holly is doing a great job at nursing them. 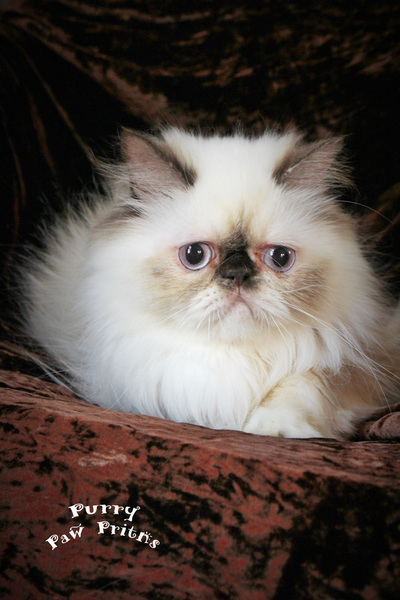 She is very affectionate with them and loves rolling next to them and sometimes on them. Just click on the click above to be taken to our Youtube channel. Enjoy! Holly's babies are also doing great and growing up so fast. They are nice and healthy and putting on good weight. Holly has calmed down a lot in the protective arena, though she is still very protective. Her babies eyes are just starting to open. Between 10 p.m. on Thursday night and 2:00 a.m. on Friday morning, Holly and Toy had three babies born. Unfortunately due to severe birth defects, one baby was put to sleep at the Vet on Friday. He was very active and healthy except for his severe cleft palate that affected his nostrils also. He could not nurse without it being a death sentence. It was heartbreaking but the Vet said I did the right thing. I tube fed this sweet heart throughout the night and morning so he would be comfortable and not hungry. So I did the absolute best I could for him. 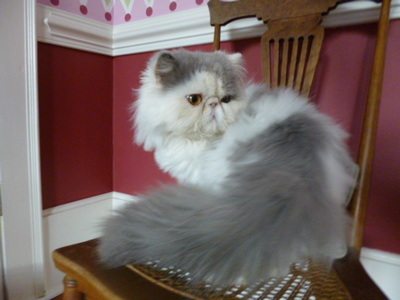 On a happier note, Holly has two boys, one Himi and one rare Chocolate and White Bi-Color Persian. It is too early yet to tell if they are extreme but my guess is doll face. I have been hand feeding them as Holly ran out of Colostrum last night. Her milk should be coming in shortly. Holly is more aggressively protective of her babies than her mother, Primrose, ever was. She also does that funny puff face to warn you. She makes it very hard to weight her babies or feed them. Primrose would be proud.